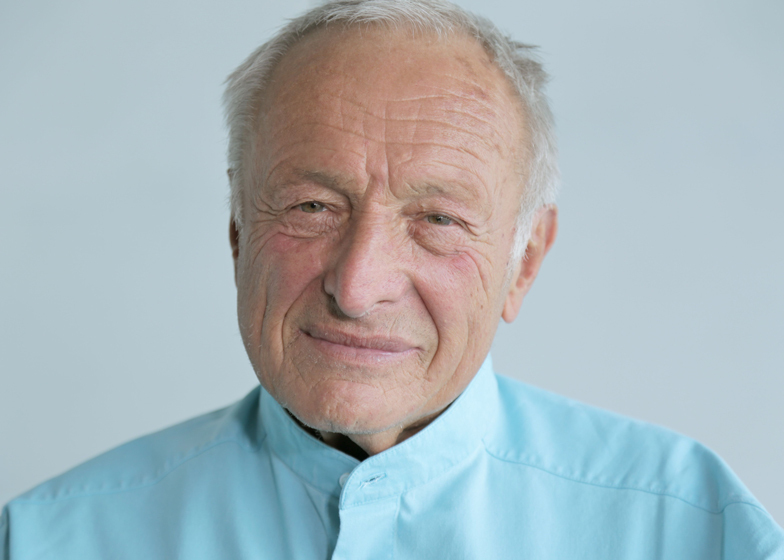 Richard Rogers says architects "have a duty to society"
News: on the eve of a major exhibition about his life, architect Richard Rogers has spoken of how architecture's civic responsibility has been eroded in "an age of greed". Update: this interview is featured in Dezeen Book of Interviews, which is on sale now for £12. "In my generation the idea was you'd build for the future," Rogers told Dezeen. "We'd just had a horrible war and there was this very strong feeling that the state could be enriched by the way we played out our abilities." He added: "This has gone. It's much more an age of greed. It's much more about dog eat dog and the acceptance that it doesn't matter what you earn, you have no duty to society." Rogers, founder of architects Rogers Stirk Harbour + Partners, spoke to Dezeen as final preparations were underway for Richard Rogers RA: Inside Out, which opens to the public at the Royal Academy in London on Thursday 18 July. "The real title [of the exhibition] is Ethos," said Rogers, who celebrates his 80th birthday this month. "The idea is that we have a responsibility to society. That gives us a role as architects not just to the client but also to the passer-by and society as a whole." The exhibition at the RA will explore the ideas and philosophies behind Rogers' work, exploring his social, political and cultural influences as well as the influence he has had on those spheres over a career spanning 50 years. "On one wall [of the exhibition] it will say 'a place for all people, all ages, all creeds, the rich and the poor'," Rogers explains. "That was actually the first paragraph I wrote with Renzo [Piano] when we entered the Pompidou competition but it also explains the heart of the exhibition. That gave us the way of handling the Pompidou, not just as a building but as a place - which I'm much more interested in." Rogers and Piano, then relatively unknown, entered the competition to design the Centre Georges Pompidou in Paris against 700 other entrants with a design for a radical, flexible building with its service ducts on the outside and a large public square in front of it. The building made both their reputations when it was completed in 1977. Rogers continues: "On another wall there will be the Hellenic oath which states 'I will leave this city more beautiful than I entered it'. It was an oath that all citizens made and I would like to think it's an oath we are all required to make." Rogers described how the social ethos of his generation led most of his contemporaries to spend time working on public projects. "I was at the Architectural Association in the 50s and then I went to Yale," Rogers said. "Everyone I was at school with went on to work for schools departments, hospital departments, housing departments, the local county council and so on. I worked on schools. I'd say 90% of students who were at the AA with me went on to work [in the public sector]." However he added that, in some senses, there are greater opportunities for architects today. "Britain now has very good modern architects. You could argue that no nation has better. Political interest? There's never been much." "But in some ways [things are] better. If you go to the City of London, it's pretty good. I was coming out the other day from the Design Museum on the other side of Tower Bridge and I thought I was in New York, with all the towers and lights. I'm not saying that it's good or bad but it's very exciting, it's very dynamic. It's something that was impossible before. It's a very exciting time." He added: "I wouldn't say that things are uglier, but we need to be very wary of protecting the public domain." Rogers won the Pritzker Prize in 2009 and was knighted in 1981 and made a lord in 1996. He has designed landmark buildings including Lloyds of London, Bordeaux Law Courts, Heathrow Terminal 5 and the Millennium Dome (now the O2 Arena). Rogers Stirk Harbour + Partners won the Stirling Prize in 2009 for their Maggie's Centre in London. Their 225 metre Leadenhall Building is currently under construction in London. Videos of our interview with Rogers will be published on Dezeen in the coming weeks. Richard Rogers RA: Inside Out is at the Royal Academy, Burlington Gardens, London from 18 July to 13 October 2013. See all our stories about Richard Rogers. The photo is copyright Dezeen Limited.